A Girl Decided To Snorkel In This Remote Lake… And What She Found Will Take Your Breath Away. WOW. Home » earth » islands » oceania » pacific ocean » palau » A Girl Decided To Snorkel In This Remote Lake… And What She Found Will Take Your Breath Away. WOW. In the middle of the Pacific Ocean, there is a place where you can find yourself amongst countless jellyfish in the water… and it’s not a complete and terrifying nightmare. The island of Palau, officially the Republic of Palau, is a country located in the western Pacific Ocean. There is a lake there named Jellyfish Lake that is filled with millions of jellyfish. The creatures migrate across the lake every day and snorkeling among them is a popular activity for tourists (even though that sounds a little insane). A snorkeler named Nana Trongratanawong decided to take a dip with the (hopefully) friendly jellyfish. Her dive was so cool, but it’d be difficult to get the courage to do something like this yourself. 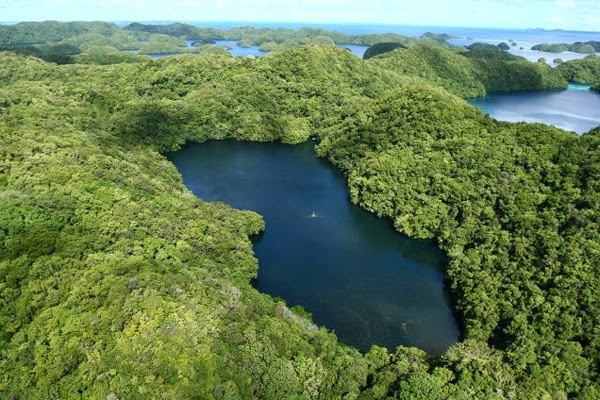 You can find the marine lake on Eil Malk island in Palau. Although it is safe to snorkel with the jellyfish, scuba diving isn’t allowed. Not only are the bubbles from the tanks potentially harmful for the jellyfish, but the anoxic layer that begins at about 15m down contains high concentrations of hydrogen sulfide which can be absorbed through the skin of a diver (which can kill you). What an incredible experience. Share it with others by clicking “Share” below!